The extra strong, double-sided adhesive is permanent, acid-free and archival safe. 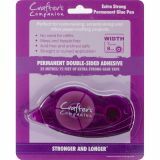 The comfortable, easy-to-grip dispenser can apply adhesive in a straight or curved line hassle-free. 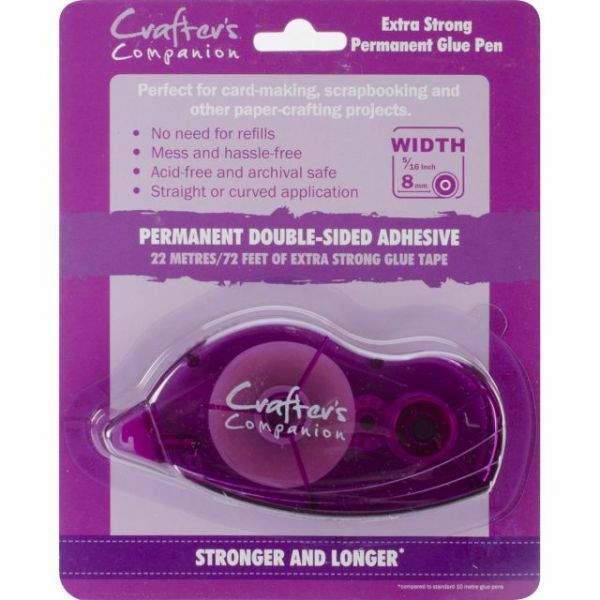 Crafter's Companion Extra Stron Glue Pen - CRAFTER'S COMPANION-Extra Strong Permanent Glue Pen. This adhesive is an economical way to apply mess-free adhesive to your paper crafts! With no refills to change it's mess and hassle free! The adhesive is acid free and archival safe. This package contains 72 feet of 5/16 inch wide permanent double-sided glue tape. Color: Purple. Tape Pen measures 2x4-1/4x1 inch. Imported.